The overview contains a brief guideline for each type of activity in order to help you get the most out of the material. 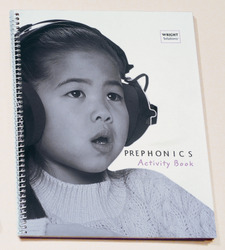 Phonological and print awareness (prephonics) should be considered the foundation necessary to establish effective sound-symbol correspondences. The transition from oral to written language needs to be explained and modeled explicitly. Children should understand the relationship between sounds and letters; that is, the awareness that certain letters and letter combinations represent specific words that they can hear and say.